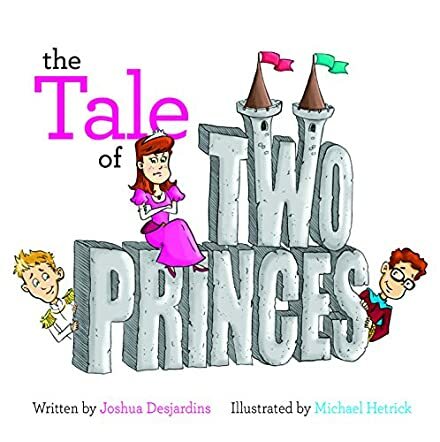 The Tale of Two Princes is a fable written by Joshua Desjardins and illustrated by Michael Hetrick. Once upon a time, Beautiful Prince lived with his parents in a castle overlooking a lake. Across the lake, Pretty Princess and her Pretty brother lived in their own castle. Together, the three children would play in the lake and in the halls of the castles. When Pretty Princess notices that the princes often play without her, she reports their unnatural behavior to the Beautiful King and Queen, who are shocked and banish both princes from their lands. After much travel, the princes eventually discover a kingdom where all are accepted rather than judged for who they are. When the remaining royals start to miss the princes, they seek them out and are immediately forgiven by the princes, grateful to see their families again. The Beautiful King and Queen open their kingdom to all, regardless of their choices in life. I actually quite enjoyed reading this tale. Although emotions were thrown to and fro during the reading of The Tale of Two Princes, Joshua Desjardins succeeded in getting the strong message across to the reader about intolerance versus acceptance, forgiveness after betrayal and more. Having grown up in a relentlessly homophobic town, watching my best friends expelled from school for their sexuality and forced into rehabilitation, I cannot recommend The Tale of Two Princes enough, especially to the younger generation. Acceptance is taught from a young age, just as bigotry and racism are. We generally learn our attitudes from our parents, our teachers and our peers. If children are able to see a behavior different to their own and accept a person for who they are, it shows that the child has been raised not to judge or condemn those who are different, whether that difference be religion, sexuality, race or belief. Understanding and acceptance is the key to a better tomorrow and The Tale of Two Princes embraces this so strongly. I wholeheartedly recommend The Tale of Two Princes to all readers, whether they are 5 or 105 years old, so that they can understand the difference between right and wrong, good and bad, and that judging people for simply being different is unacceptable in today’s society.